On May 2nd, 2013, a very important addition to the WSU Pullman campus was dedicated. 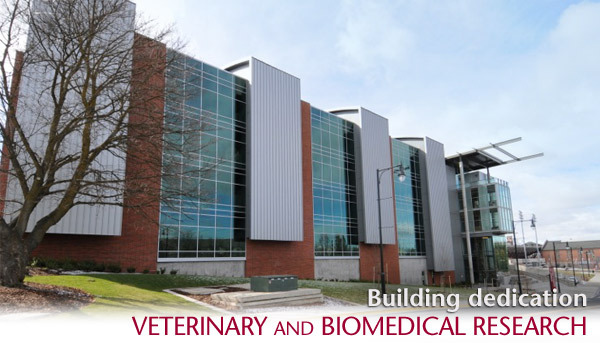 The Veterinary and Biomedical Research Building (VMRB) is now the seventh connected building in the WSU Research and Educational Complex. This new building will foster research relating specifically to biomedical questions revolving around human and animal health. Heart health: How, by uncovering the biophysical mechanisms of cardiac muscle contraction, new discoveries into cardiac function and disease can be revealed. Emotional health: How understanding the basis of emotions of companion and production animals can improve the lives of people with affective disorders. Sleep and circadian rhythms: How rhythms, dysrhythms, and circadian biology affect animal biology and can improve and inhibit daily functions in animals and people. Neurological diseases: How neurodegenerative diseases, such as Parkinson’s disease, can be treated more effectively by discovering the underlying causes and subsequently creating treatments to repair the loss of functionality. Obesity and Diabetes: How obesity and diabetes can be prevented by studying and understanding the relationship between the consumption of food and how energy is consequently regulated into the body. Drug addiction: How the biological actions of commonly abused drugs can be used to reverse the destrctive nature of addiction and help prevent the relapses of drug users. This research facility is operating east of the Martin Stadium entrance and south of the Beasley Coliseum parking lot. This building boasts 77,250 net square feet (128,000 gross square feet) of state-of-the-art space, highly suitable for biomedical research, health science teaching, and research programs. Also included in this structure is a vivarium (an indoor facility for safely housing animals and plants in their natural environments for humane scientific observation), which will allow for gene targeting of the animals and provide necessary quarantined space to guarantee uncontaminated research. These labs and offices were specifically designed with the Veterinary Medicine Department of Integrative Physiology and Neuroscience in mind. Washington State University’s College of Veterinary Medicine (CVM) is one of the top leaders in research benefiting to animal and human health and well being. In fact, solely during the 2006 fiscal year, the research faculty placed the CVM well into the top tier of all veterinary schools by working with over $12.5 million in competitively funded research.